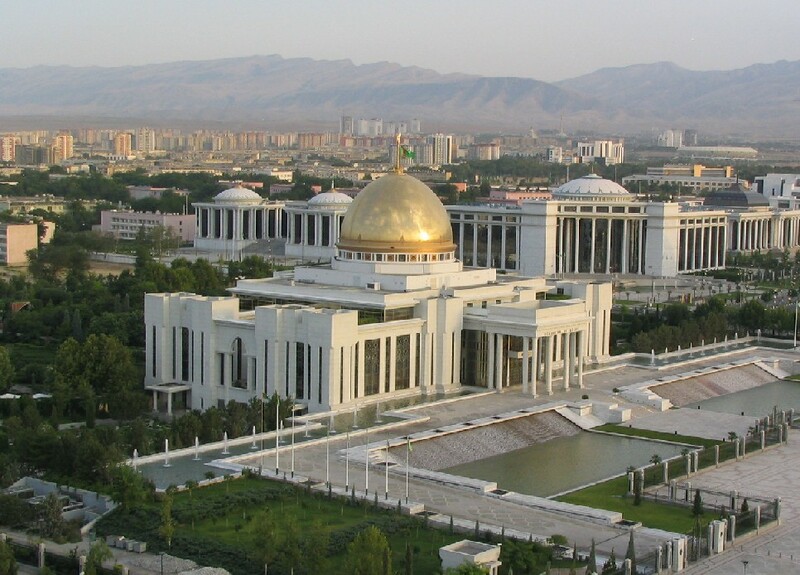 Ashgabat is the capital and the largest city in Turkmenistan, located between the Kara Kum desert and the Kopet Dag mountain range in the south-central part of the country. The Partian Fortresses of Nissa (Nisa) are a UNESCO World Heritage Site located 10 miles (17 km) east of Ashgabat. These comprise two separate complexes, flattened and leveled with layers of earth. and surrounded by high defensive earthen ramparts with 40 rectangular towers. Ashgabat is primarily a government and administrative center, and it is also Turkmenistan's attempt to build a City Of The Future. Nearly all of the major buildings in the city are only decades old and are notable for their vast scale and near-universal use of white marble – making Ashgabat a kind of White City. Among the most famous modern landmarks are The Arch of Neutrality, an outdoor monument, and Turkmenistan Tower, the tallest building in the country. Old Nisa is a natural hill surrounded by high defensive earthen ramparts with 40 rectangular towers. The Northern Complex includes the so-called large square building in which the royal treasury, wine vaults and auxiliary buildings have been identified. The Central Complex consists of a Building with the Square Hall, a Building with the Round Hall, a Tower-like Building, a North-Eastern Building and a Columned Hall. New Nisa is located about a mile northwest of Old Nisa. It is surrounded on all sides by powerful walls with a height up to 9 meters. It has two entrances (one from Bagyr village and one from the North West). The layout clearly indicates a densely populated town. The Parthian buildings are interpreted as remains of the fortress, burial houses and storehouses. The Russian Bazaar or Gulistan in central Ashgabat is one of the largest and oldest covered markets in the Turkmenistan. Despite the emergence of new stores and malls in Ashgabat, markets continue to be popular. The range of goods is enormous, and the bazaar also houses shops and eateries. The oriental bazaar Altyn Asyr (formerly known as Tolkuchka) is the largest market in Turkmenistan, and one of the largest open air markets in Central Asia. At the heart of the bazaar is a tall clock tower, its main landmark. The market is noted in particular for its sale of large red Turkmen rugs. The market thrives especially on Sundays and sells a massive range of goods, from Turkmen carpets, handicrafts and silks, jewelry and jeans to laundry soap, plastic bags to bales of rice. It also has a notable camel market as well as other live animals. It is located in the outskirts of Ashgabat, in the residential area Choganly.